Thanks to Auntie's Beads, the next glass pendant giveaway starts today, just as the old contest ends! This will be the last giveaway of the season, because I want to make sure that these little packages don't get lost in the flood of holiday mail...plus, I want you to get it in time for Christmas! 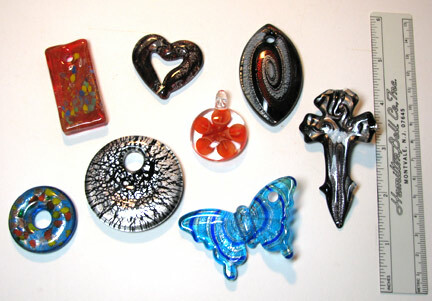 The last pendant giveaway for 2010 is the floral pendant right in the center of the picture (Murano Style Glass Pendant, Round With Orange Flower, 30mm.). All you need to do for a chance to win it is to leave me a comment telling me what you plan to use it for and you'll automatically be entered. If you tweet or post on Facebook or other social spots about the contest, you can leave a second comment and be entered twice! Please please please make sure that your link will lead me to an email address, or else I won't be able to contact you. No contact, no win, and I simply have to go on to the next person. Deadline: December 16, 2010. More chances to win in 2011! I would use this one for a necklace for my niece! P.S. Where do you post your winners? Hello and thank you for taking the time to help teach us new techiques. Love the macrame necklace! I think that is gorgeous! I would make a necklace for one of my daughters with it! A love flowers so I think this pendant is lovely. That one's cute! It would make an adorable necklace! I think this flower pendant would look great with rock crystal and carnelian! This would be lovely as a necklace with rutilated quartz and carnelian or jasper. Thanks!! I'd probably make a necklace for my Secret Santa partner.She loves orange!! Thanks for the fun giveaway. It would be a great necklace focal point, and a wonderful stocking stuffer. What fun! Looks like a fun blast from the past, given to someone who loves music, current as well as that from the 60's and 70's.